I RECENTLY began attending meetings at an organisation that shall remain unnamed where, as expected during such official meetings, a sensible amount of tea and coffee is served and consumed. That automatically necessitates trips to the ‘washrooms’ at one point or another, and on my first such trip I was distressed to find the door to relief firmly locked. I danced gingerly at the end of the corridor as I investigated the whereabouts of the key or the person in charge of granting access, until I was directed to toilets on the lower level of the building. These were ordinary toilets, it turned out, as opposed to the locked ones protected for ‘Management’. With time, I was given such clearance that whenever I stepped out of the room the person with the key (sitting in an ante-room with the door wide open in order to respond to such events in a timely fashion) sprung into action and provided access. At our next meeting, the Toilet Key Controller had realised it made sense to simply leave the door unlocked for the duration of the meeting. At one point in the day, however, apparently because a couple of ordinary staff had gained access to the special ‘Management’ toilet, the Key Controller took to locking the door at intervals – coinciding with one or two of my trips. Eventually, I got fed up of the anxiety I felt every time I made my way down that corridor. I long ago decided that toilet access was too low down in the order of priorities in my life to cause me such angst. And luckily I got to the toilet to find the Key Controller had left the set of keys behind. Within seconds I had hidden them in a difficult place, and it was while I was doing so that I realised how ridiculous the situation was. This special toilet was not remarkable at all. One of the two toilets didn’t even have a toilet seat, there was a layer of dust over everything, cobwebs here and there, and piles of broken plastic things that started out in life as buckets, brushes and other items I could not recognise. The water in the bowl was generally clean to the eye, as was the one running out of the taps. There were hard bits of things that seemed to be stones masquerading as soap. Or maybe they were just stones that cynical toilet cleaners had placed there as a prank. I laughed a little at the thought that oppressed staff were generally playing an elaborate prank on ‘Management’ by not cleaning the windows, gathering bits of rubbish into the corner, and then locking the toilets to mock them. They just hadn’t labelled the toilet door: ‘VIP’. Any office in which such an arrangement exists is unquestionably poorly managed, by people with a low-self esteem who seek to mimic their counterparts in companies where the senior staff have en suite toilet cubicles. It is a sad environment in which that low self-esteem in ‘Management’ trickles down. I couldn’t imagine their career aspirations; was there someone below them in charge of the toilets for general staff? Locking a toilet is one thing; deploying an entire human being to manage its being locked is another; doing both yet the toilet is dirty and has neither seats nor hand washing soap points to a serious lack of priorities on the part of the toilet owner. I must confess to having left many toilet doors unlocked after being given a key, because I am an anarchist that way. Some people believe that everybody should have access to drinking water, as water is life; if that is the case, then they should have access to facilities naturally at the other end of that equation. A pal of mine, Rukaka Mugizi, took up a toilet habit that some people found irritating but I quite liked. While he was resident in Kampala after spending a few years ago studying medicine in Cuba, he began photographing toilets in various places round the city. 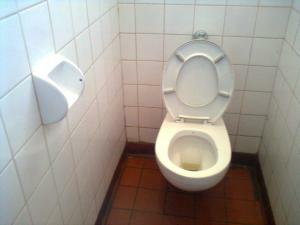 It started with the toilets of a popular local that a number of us frequented, in Bukoto. Rukaka could not understand how yuppies and middle class people could spend time and money drinking beer and eating chicken at a place with toilets this bad. One night he took photographs of the loos, and then emailed them round the next day in the belief that in broad daylight his mates would appreciate better the ironical error of their night-time ways. It didn’t work. It couldn’t – many at that time worked in places where ‘Management’ kept dirty, semi-functional toilets securely under lock and key, and I cannot say what domestic toilets looked like. So, for a while, everywhere he went he took photos of toilets and emailed them to the group. Sadly, he eventually stopped; but the group didn’t stop drinking and eating chicken at the dirty-toilet, water-less kafunda because of this. Neither did they tell their ‘Managers’ to focus on more important issues in the office than access to the toilet.